Rare photo of rocket damage in Israel? Or fire at the petrol pump? In the interests of journalistic integrity, we post this rare photo of rocket damage in Ashdod, Israel, about 23 miles north of the Gaza border, halfway to Tel Aviv. 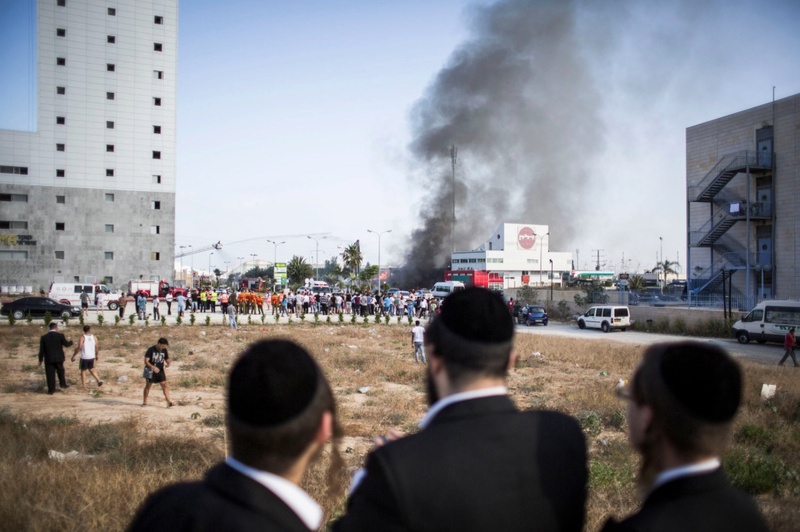 The caption says residents are watching firefighters douse fire from a rocket that hit a petrol station & does not claim it is a Hamas rocket. For all we know, it could be a fire at the pump or a car fire having nothing to do with rockets. Why do we say that? Because if ABC news can put up footage of a Muslim woman in veil standing in bombing rubble & claim it’s Israel rather than Gaza, then truth in journalism doesn’t mean squat. If Israel can rain down thousands of tonnage of bombs on cities in Gaza, calling it precision bombing to take out Hamas commanders, & media howls only about home-made rockets from Gaza, then war reporting becomes a farce. It cannot be said often enough: there is no military parity between Gaza & Israel since Gaza has no military & Israel has one of the mightiest in the world. But there is a distinction between self-defense & ethnic cleansing. The caption doesn’t accurately report the number of deaths, injuries, & massive property damage in Gaza. It claims 90 have died in Gaza but admits not a single soul has died in Israel. That harsh & telling contrast does not give media pause because they are not reporting news; they are fabricating an alibi for Israeli genocide. The death toll in Gaza is now well over 100 with hundreds & hundreds of injuries. And when we say injuries, we don’t mean just scratches, but broken limbs, concussions, permanent disabilities from being bombed. There is massive property damage which Israel claims are Hamas arsenals but photojournalism clearly identifies as homes. And according to the Israeli government, this genocidal siege has only just begun. There are massive protests around the world in solidarity with Palestinian justice & opposed to Israeli ethnic cleansing. Palestinians are less politically isolated today than they were ten years ago or even since the last genocidal bombing siege over Gaza–because with every new murderous assault, more & more people around the world are learning the truth in place of media alibis for Israel. (In 1967, I was disturbed by the media frenzy in support of Israel & saw a young Palestinian picketing at the University of Minnesota student union. I wanted to understand–even though I couldn’t have found Israel or Palestine on a map at that time–& asked the young man why he was picketing. He was afraid, because the political climate then was nourished by the Israeli propaganda film “Exodus”, & he answered me gruffly, “They stole our land.” Didn’t tell me much except that I needed to investigate the issue more deeply. The political defeat of Zionist racism is a historic mission of our generation. A Palestinian victory heralding a democratic secular state where Jews & Arabs can live in harmony would reverberate around the world, fatally weaken the stranglehold of racism & colonialism, & inspire resistance in millions of human beings still held in the grip of tyranny. If you can’t picket, join the boycott in support of Palestinian justice.